This article is about Christian teachings. For an overview, see Son of man. For other usage, see Son of man (disambiguation). The Son of man with a sword among the seven lampstands, in John’s vision, from the Bamberg Apocalypse, 11th century. Son of man is an expression in the sayings of Jesus in Christian writings, including the Gospels, the Acts of the Apostles and the Book of Revelation. The meaning of the expression is controversial. Interpretation of the use of “the Son of man” in the New Testament has remained challenging and after 150 years of debate no consensus on the issue has emerged among scholars. The expression “the Son of man” occurs 81 times in the Greek text of the four Canonical gospels, and is used only in the sayings of Jesus. The singular Hebrew expression “son of man” (בן–אדם i.e. ben-‘adam) also appears in the Hebrew Bible over a hundred times. The use of the definite article in “the Son of man” in the Koine Greek of the Christian gospels is novel, and before its use there, no records of its use in any of the surviving Greek documents of antiquity exist. Geza Vermes has stated that the use of “the Son of man” in the Christian gospels is unrelated to Hebrew Bible usages. For centuries, the Christological perspective on Son of man has been seen as a possible counterpart to that of Son of God and just as Son of God affirms the divinity of Jesus, in a number of cases Son of man affirms his humanity. However, while the profession of Jesus as the Son of God has been an essential element of Christian creeds since the Apostolic age, such professions do not apply to Son of man and the proclamation of Jesus as the Son of man has never been an article of faith in Christianity. In the Koine Greek of the New Testament, “the son of man” is “ὁ υἱὸς τοὺ ἀνθρώπου” (ho huios tou anthropou). The singular Hebrew expression “son of man” (בן–אדם i.e. ben-‘adam) also appears over a hundred times in the Hebrew Bible. In thirty two cases, the phrase appears in intermediate plural form “sons of men”, i.e. human beings. The expression “the Son of man” appears 81 times in the Koine Greek of the four Gospels: thirty times in Matthew, 14 times in Mark, twenty five times in Luke and 12 times in John. However, the use of the definite article in “the Son of man” is novel, and before its use in the Canonical gospels, there are no records of its use in any of the surviving Greek documents of antiquity. In the Christian scriptures, Jesus uses the reference for himself more than Son of God. The attributes given to “the Son of man” in the Christian scriptures seem to correspond with those found in the Book of Daniel of the Hebrew scriptures – Daniel 7:13-14 “As I watched in the night visions, I saw one like a son of man coming with the clouds of heaven. And he came to the Ancient One and was presented before him. To him was given dominion and glory and kingship, that all peoples, nations, and languages should serve him. His dominion is an everlasting dominion that shall not pass away, and his kingship is one that shall never be destroyed.” The New Testament claims, in Revelation, that Jesus will come to earth on the “clouds of heaven,” and that he will be given unending dominion and authority. It describes him as the “ruler of the kings of the earth,” to be served and worshiped by all nations, people, and language groups. Geza Vermes has stated that “the son of man” in the New Testament is unrelated to Hebrew Bible usages. Vermes begins with the observation that there is no example of “the” son of man in Hebrew sources and suggests that the term originates in Aramaic — ברנש – bar nash/bar nasha. He concludes that in these sources “Son of man” is a regular expression for man in general and often serves as an indefinite pronoun and in none of the extant texts does “son of man” figure as a title. The occurrences of Son of man in the Synoptic gospels are generally categorized into three groups: (i) those that refer to his “coming” (as an exaltation); (ii) those that refer to “suffering” and (iii) those that refer to “now at work” i.e. referring to the earthly life. The presentation of Son of man in the Gospel of John is somewhat different from the Synoptics: in John 1:51 he is presented as contact with God through “angelic instrumentality”, in John 6:26 and 6:53 he provides life through his death, and in John 5:27 he holds the power to judge men. In Matthew 8:20 and Luke 9:58 Jesus states: “The foxes have holes, and the birds of the sky have nests, but the Son of man has nowhere to lay his head.” This phrasing seems to tie in with the Old Testament prophetic expressions used by such prophets as Ezekiel, and it shows Jesus’ understanding of himself as the “man” that God has singled out as a friend and representative. A page from Matthew, from Papyrus 1, c. 250. Son of man appears 30 times in Matthew’s gospel. In Matthew 18:11 Jesus refers to Son of man came to serve and states: “For the Son of man is come to save that which was lost.”. In the Gospel of Mark 10:35–45 this episode takes place shortly after Jesus predicts his death. Mark 2:27-28, Matthew 12:8 and Luke 6:5 include the Lord of the Sabbath pericope where Jesus tells the Pharisees “The sabbath was made for man, and not man for the sabbath: so that the Son of man is lord even of the sabbath.” Christians commonly take the phrase “son of man” in this passage to refer to Jesus himself. Most scholars and theologians agree that the use of Son of man in this pericope is consistent with that of self-reference. He answered and said to them: “He who sows the good seed is the Son of man…. The Son of man will send out His angels, and they will gather out of His kingdom all things that offend, and those who practice lawlessness, and will cast them into the furnace of fire. There will be wailing and gnashing of teeth. Christians commonly take the phrase “son of man” in this passage to refer to Jesus himself, rather than humanity in general. When Jesus predicts his death. But when the Son of Man comes in his glory, and all the angels with him, then he will sit upon his glorious throne. All the nations will be gathered in his presence, and he will separate them as a shepherd separates the sheep from the goats. The first chapter of the Book of Revelation refers to “one like a Son of man” in Revelation 1:12-13 which radiantly stands in glory and speaks to the author. In the Gospel of John Jesus is not just a messianic figure, nor a prophet like Moses, but the key emphasis is on his dual role as Son of God and Son of man. Nathanael answered and said to Him, “Rabbi, You are the Son of God! You are the King of Israel!” Jesus answered and said to him, “Because I said to you, ‘I saw you under the fig tree,’ do you believe? You will see greater things than these.” And He said to him, “Most assuredly, I say to you, hereafter you shall see heaven open, and the angels of God ascending and descending upon the Son of man. This passage may be an allusion to Jacob’s Ladder. In any case, the implication is that seeing the angels ascending and descending on the “Son of man” (i.e. the speaker, Jesus) would be a great wonder. Most assuredly, I say to you, the hour is coming, and now is, when the dead will hear the voice of the Son of God; and those who hear will live. For as the Father has life in Himself, so He has granted the Son to have life in Himself, and has given Him authority to execute judgment also, because He is the Son of man. When you see the Son of man lifted up, then you shall know I am. John’s vision of the Son of Man is a key Johannine reference to the Son of man. In both Revelation 1:12 and 14:14, John reports seeing one “like the Son of Man”. In 1:12, he is identified as the author of the letters to the seven churches in Revelation 2 and 3. When they heard these things, they became enraged and ground their teeth at Stephen. But filled with the Holy Spirit, he gazed into heaven and saw the glory of God and Jesus standing at the right hand of God. “Look,” he said, “I see the heavens opened and the Son of Man standing at the right hand of God!” But they covered their ears, and with a loud shout all rushed together against him. It is thought by Christian scholars that the author of Acts (also believed to be the author of Luke) includes this reference to “the Son of Man” as a direct reference to Jesus and his previous ascension, to sit at the Right Hand of God in Heaven. They would argue that in Daniel 7, “the Son of Man” refers to his ascending back to his rightful throne and this is the precise picture of him fulfilling such a role as he receives the spirit of Stephen and judges the Pharisees who stoned Stephen, although the complete Judgment (Last judgment?) will occur at the Great White Throne judgment at the end of the age. See Book of Revelation 20 and Christian eschatology. …in the language of Adam, Man of Holiness is his name, and the name of his Only Begotten is the Son of Man, even Jesus Christ, a righteous Judge, who shall come in the meridian of time. The interpretation of the use of “the Son of man” in the New Testament has proven to be challenging, and James D. G. Dunn and separately Delbert Burkett state that it is a prime example of the limits of New Testament interpretation because after 150 years of debate no consensus on its meaning has emerged. The earliest approaches, going back to the Fathers of the Church, relied on the Greek expression and interpreted “son” in a parental sense. This approach continued into the Middle Ages. By the time the Protestant Reformation was under way, three new approaches had emerged, one that saw it as an expression of the humanity of Jesus, another that viewed it as a messianic title derived from the Book of Daniel (7.13) and a third which considered it as a general idiom for self-reference. By the 17th century, the first approach (focusing on his humanity) had gained ground, yet by the 19th century the messianic view had increased in popularity. In the last part of the 20th century, the messianic view was highly criticized and the concept of idiomatic use began to gain support among some scholars. However, no consensus has emerged among scholars on how the expression can be interpreted. In Judaism, “son of man” denotes mankind generally in contrast to deity or godhead, with special reference to their weakness and frailty (Job 25:6; Psalms 8:4; Psalms 144:3; Psalms 146:3; Isaiah 51:12, etc.) or the term “ben adam” is but a formal substitute for the personal pronoun. Christ, by Titian – (detail) 1553, oil on canvas, 68x62cm, Prado Museum Madrid. Sixty-nine times in the Synoptic Gospels Jesus calls himself (the) “Son of man”, a Greek expression which in its Aramaic (and Hebrew) background could be an oblique way for indicating the speaker’s own self (e.g., Matt 8:20), or else simply mean “someone” or “a human being” (as in Ps 8:4, where it is a poetic variant for “man”). In Daniel 7:13-14 the “Son of man” seems to symbolize the angels (perhaps the archangel Michael) and/or the righteous and persecuted Jews who will be vindicated and given authority by God (Dan 7:18,21-22,27; 10:13,21; 12:1) rather than function as one individual, heavenly figure who represents the people. What is clear from the evidence is that “Son of man” did not function in pre-Christian messianic expectations as a title for a deliverer expected to come in the last times. It was not even a sharply defined concept, with a specific content and reference. It could simply denote a member of the human race (Ps. 8:4) or be a way of pointing to a prophet’s insignificance and finite dependence in the face of God’s glory and infinite power. Therefore, God addresses Ezekiel ninety-three times as “son of man”. According to the Synoptic Gospels, Jesus referred to himself as “Son of man” in three contexts, each with its own circle of fairly distinct meanings. He used this self-designation of (1) his earthly work and its (frequently) humble condition (e.g., Mark 2:10, 28 parr. ; Matt 11:19=Luke 7:34; Matt 8:20=Luke 9:58); (2) his coming suffering, death, and resurrection (Mark 9:9,12; Mark 14:21 and, above all, Mark 8:31; 9:31; 10:33-34 parr. ); (3) his future coming in heavenly glory to act with sovereign power at a final judgement (e.g., Mark 8:38; 13:26-27 parr. ; Matt 24:27=Luke 17:24; Matt 25:31-32; see John 5:27). These classifications show how the “Son of man” served as a way of indicating Jesus’ importance and even universal relevance. This was especially true of the class (3) sayings. In other words, “Son of man” was used to say what Jesus did rather than what he was. It was not and did not become a title in the normal sense — at least not on the lips of Jesus himself. At the same time, the evangelists (and/or their sources) do not always seem to distinguish “Son of man” sharply from “Christ/Messiah” or “Son of God”. For Mark, the Davidic Messiah and Daniel‘s Son of man are one and same person, and their name is Jesus. In Mark 14:61-62, the reply that Jesus makes to the high priest’s question (“Are you the Messiah, the Son of the Blessed One?”) conveys some glorious connotations of “the Son of God” as a figure who will come in triumph on the clouds of heaven to judge his enemies: “I am; and you will see the Son of man seated at the right hand of the Power, and coming with the clouds of heaven”. In John’s Gospel the expression gains a very significant element, not to be found in the Synoptic Gospels under any of the three meanings listed above: the “Son of man” is a personally pre-existent figure (e.g., John 3:13; John 6:62). As regards Jesus himself, much debate originated in deciding whether any or all of the three classes of self-referential sayings derived from what he said in his ministry. A few scholars have even attempted to prove that none of the “Son of man” sayings came from Jesus himself. However, there remain good and convergent reasons for maintaining that, while there was some editorial reworking, Jesus did speak of himself as “Son of man”, filled the term with his own meanings, and was responsible for the three classes of “Son of man” sayings listed above. Along with the way he used the image of the kingdom of God and that of God as Father, here a third classic example is supplied of Jesus taking an inherited expression and using it massively but in his own way. First, one does not find others ever describing, addressing, or confessing Jesus as the Son of man apart from four marginal cases (Acts 7:56; Rev. 1:13; 14:14; Heb. 2:6). In the last three cases one is dealing with quotations from the Old Testament. In the Gospels themselves other people address and speak about Jesus in a variety of ways, but never directly as “Son of man”. According to John 12:34, the audience of Jesus were puzzled when he referred to himself as “the Son of man”. Now, if the early Church had freely created the Son of man sayings, it would be puzzling that this designation for Jesus is not found on the lips of others. The puzzle disappears once it is agreed that there is here a genuine historical recollection: only Jesus used the term, and the evangelists and their sources faithfully recorded that fact. Second, the Son of man sayings in which Jesus refers to his (often humble and merciful) earthly activity are attested by both Mark (e.g., Mark 2:10, 28) and Q source (Matt 8:20=Luke 9:58; Matt 11:19=Luke 7:34). The sayings dealing with the coming or apocalyptic Son of man likewise turn up in Mark (Mark 8:38; 13:26; 14:62) and in Q (e.g., Matt 24:27=Luke 17:24. This double strand of tradition or multiple attestation can encourage one to attribute to Jesus at least class (1) and class (3) of the Son of man sayings. Third, there was some Jewish background to Jesus’ Son of man sayings, but there was scarcely any follow-up in the emerging Church. Later on the Church Fathers would use the term as a way of referring to Christ’s humanity as opposed to his divinity or to his being the Son of God. However, in the first century the designation does not seem to have been useful in preaching the good news. It does not appear in credal and liturgical formulas. It was too flexible and even vague: it ranges from the mysterious heavenly being of Daniel 7 to simply serving as a circumlocution for “I”. Linguistically, it was a particularly odd expression for Greek-speaking people. The fact that the designation was strange and unsuitable for the early Church’s life and ministry suggests that the Son of man sayings did not derive from groups in the Church, but from another source, which could only really be Jesus himself. Fourth, the sayings about the coming Son of man sometimes imply a certain differentiation between this figure and Jesus. Therefore, Luke reports Jesus as declaring: “Every one who acknowledges me before men, the Son of man also will acknowledge before the angels of God” (Luke 12:8. Matthew modiefies this Q saying to read: “Every one who acknowledges me before men, I also will acknowledge before my Father who is in heaven” (Matt. 10:32). Apparently, Luke has preserved the original form of the saying, which indicates a certain unity of function between Jesus himself and the Son of man, but at the same time introduces some differentiation between the two figures. The differentiation makes sense once it is recognised that it recalls a turn of phrase actually used by Jesus to distinguish his present preaching from his future judging. The distinction had its point in the historical context of his ministry, but not later in the post-Easter situation where believers acknowledged the personal unity between the risen Jesus and the Son of man who would come in glory. Matthew’s modification reflects precisely that shift. Fifth, there are some unusual features about the preservation of the “Son of man” sayings. The three classes are not blended together. Thus (2) the passion predictions about the Son of man do not go beyond the death and resurrection to include (3) statements about the future coming of the Son of man. Furthermore, the sayings about God’s kingdom and, specifically, the parables never introduce the Son of man. The absence of a clear and strong connection between the Son of man and the divine kingdom is puzzling. After all, Daniel 7 was relevant for the functions of the Son of man, and the Danielic imagery had included God’s kingdom (Daniel 2:44; 4:3; 7:27). The independence of the three classes of Son of man sayings and the separation of the kingdom sayings from the Son of man can be explained if one sees the Gospels (and the traditions behind them) accurately preserving here distinctions that genuinely went back to Jesus’ actual preaching and teaching. For centuries, the Christological perspective on Son of man has been seen as a possible counterpart to that of Son of God and just as Son of God affirms the divinity of Jesus, in a number of cases Son of man affirms his humanity. 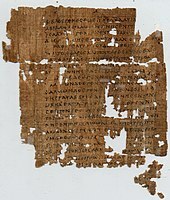 However, while of all the Christological titles used in the New Testament, Son of God has had one of the most lasting impacts in Christian history and has become part of the profession of faith by many Christians, the proclamation of Son of man has never been an article of faith in Christianity. Thus in the mainstream Trinitarian context it is the Son of God title which implies the full divinity of Jesus as part of the Holy Trinity of Father, Son and the Spirit. Christ Jesus, the Son of God, is God and Man: God before all worlds, man in our world…. But since he is the only Son of God, by nature and not by grace, he became also the Son of Man that he might be full of grace as well. Although Son of man is a distinct concept from Son of God, some gospel passages may seem to equate them in some cases, e.g. in Mark 14:61, during the Sanhedrin trial of Jesus when the high priest asked Jesus: “Are you the Messiah, the Son of the Blessed one?” Jesus responded “I am: and you shall see the Son of man sitting at the right hand of Power, and coming with the clouds of heaven.”. This seems to build on the statement in Mark 9:31 that “The Son of man is delivered up into the hands of men, and they shall kill him; and when he is killed, after three days he shall rise again.” In the parable of the Sheep and the Goats, the returning Son of man has the power to judge, by separating men from “all the nations” into distinct groups, in Matthew 25:31–46. However, James Dunn has pointed out that there is no overall scholarly agreement on these issues, and the Christological debates have continued for well over a century without the emergence of consensus. Jump up^ Dunn, Edited by James D.G. ; McKnight, Scot (2005). The historical Jesus in recent research. Winona Lake, Ind. : Eisenbrauns. p. 337. ISBN 1-57506-100-7. Jump up^ j., SDB Moloney, Francis. Mark: Storyteller, Interpreter, Evangelist. Hendrickson Publishers. p. 50. ISBN 978-1-56563-513-5. Jump up^ “Man of Holiness”. Encyclopedia of Mormonism. Harold B. Lee Library, Brigham Young University. Retrieved 19 January 2015. Jump up^ “Moses 6:57”. Pearl of Great Price. Salt Lake City, Utah, USA: The Church of Jesus Christ of Latter-day Saints. Retrieved 19 January 2015. Jump up^ “SON OF MAN”. Jewish Encyclopedia. JewishEncyclopedia.com. Retrieved 19 August 2013. Jump up^ For accuracy, it should be noted that within Daniel 7:13-14 “the one like a Son of man” is not personally linked with suffering, still less with death. For this and subsequent observations and commentary, compare Gerald O’Collins, Christology: A Biblical, Historical, and Systematic Study of Jesus. Oxford: OUP (2009), pp. 59-67; J. D. G. Dunn, Christology in the Making, London: SCM Press (1989), passim. Jump up^ On the various interpretations of “Son of man”, cf. Dunn, op. cit., pp. 65-97; C. A. Evans, “Jesus’ Self-Designation ‘The Son of Man’ and the Recognition of his Divinity”, in S.T. Davis, D. Kendall, and O’Collins (eds), The Trinity. Oxford: OUP (1999), pp.29-47; A. Fitzmyer, A Wandering Aramean. Missoula, Mont. : Scholars Press (1979), pp. 143-160; D.R.A. Hare, The Son of Man Tradition. Minneapolis: Fortress Press (1990); J. Nolland, Luke, 3 vols Dallas: Word Books (1989-1993), ii, pp. 468-474; id., The Gospel of Matthew. Grand Rapids, Mich.: Eedermans (2005), pp. 365-366. ^ Jump up to:a b c d e f g Cf. G. O’Collins, Christology: A Biblical, Historical, and Systematic Study of Jesus, pp. 62-65. Jump up^ For contrasting views, cf. D.R.A. Hare, op. cit. ; Dunn, op. cit., pp. 68-90; see also n. 15. Jump up^ On this, compare also J. D. G. Dunn, Christology in the Making, pp. 70ff. Jump up^ On this, compare esp. O’Collins, op. cit., p. 64. Jump up^ As some wit put it, “the kingdom has no Son of man, and the Son of man has no kingdom”. A partial exception comes in Matthew’s story of the final judgement in which the Son of man (25:31) is also called “the king” (25:34, 40). Borgen, Peder. Early Christianity and Hellenistic Judaism, Edinburgh: T & T Clark Publishing. 1996. Brown, Raymond. An Introduction to the New Testament, New York: Doubleday. 1997. Buth, Randall. “A More Complete Semitic Background for bar-enasha ‘Son of Man'”, in Craig A. Evans and James A. Sanders, eds. The Function of Scripture in Early Jewish and Christian Tradition (JSNT Suppl 154) Sheffield Academic Press, 1998: 176-189. Fischel, Henry A. (ed.). Essays in Greco-Roman and Related Talmudic Literature, New York: KTAV Publishing House. 1977. O’Collins, Gerald. Christology: A Biblical, Historical, and Systematic Study of Jesus. Oxford:Oxford University Press. 2009. This page was last edited on 27 March 2017, at 14:06.